Creamy moisturising and nourishing body lotion based on argan oil and olive intensively moisturises and nourishes skin, at the same time giving it silky smoothness and exceptional firmness. Pleasant and light consistency makes the lotion absorbing quickly and leaving long-lasting feeling of comfort and moisture for even up to 24 hours. Just after a week of application, skin maintains moisture at optimum level, looks more beautiful and younger. Fresh scent of olive relaxes and adds positive energy. Unique and rich composition guarantees complex care. Hyaluronic acid gives the feeling of deep moisture and soothing. 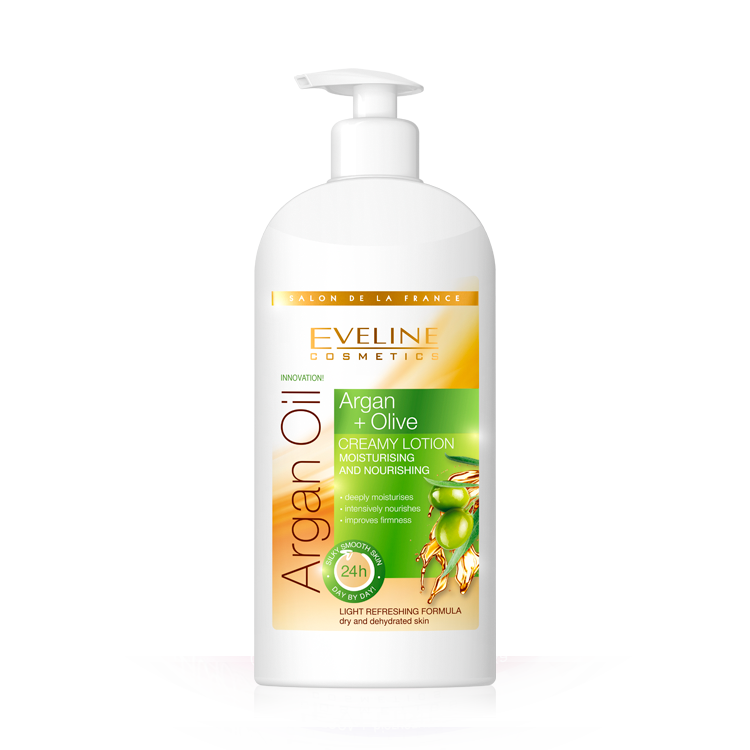 Argan oil intensively nourishes, moisturises, regenerates and rejuvenates skin. Olive oil + olive leaves extract soothe moisture and smoothe out as well as make the skin exceptionally soft and silky to the touch. Collagen and elastin – prevent skin flabbiness, restore lost elasticity thus stop the ageing process. Skin becomes resilient, well-tensed and regenerated. Soybean oil rich in unsaturated fatty acids nourishes and greases skin. Stimulates tissues to regeneration, delays ageing process. Allantoin moisturises, soothes irritations, brings alleviation. Vitamins A+E+F – restrain ageing process, improving elasticity and softness of epidermis. Urea – intensively and long-lastingly moisturises skin. Regulates the process of proper exfoliation.